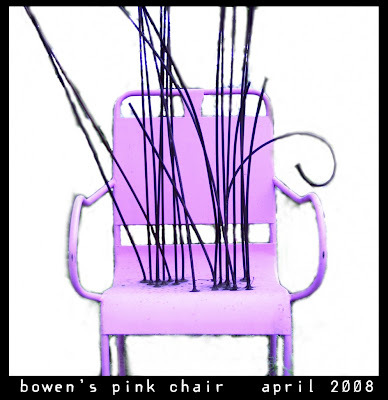 This is a photograph of the pink chair I talked about the other day - the one I spied up in a yard on my way in to the lab. As I went by this morning, there were 2 people standing on the front porch of the house in whose yard this chair presides. And it made me crazy because I wanted to ask their permission to get up in the yard & take the photo, but it made my stomach very uncomfortable - I don't call this Tales of Art & Anxiety for nothing - but I turned my car around, parked & did just that. And I FELL as I was saying hello to the woman - how embarrassing is THAT? Needless to say, my anxiety level really ratcheted up, along with my humiliation level (and people think art isn't hard? ), but it has been raining & the grass was wet & slick, and I wasn't hurt, but STILL!!!! Anyway, despite my red face & despite trying to catch my breath, I asked. And it turns out the house belongs to the guy & he was very cool about it. In fact, they were both very cool, much cooler than I - young & hip & tattooed, which also made me feel goofy & ridiculous. The house is also pretty cool. Great porch, great spaces to hang out. The chair was made by Bowen Hardy, a friend of the house's owner (whose name I forget - I'm so sorry - I was so rattled by facing my fear about telling people I'm an artist & falling & everything). So I took the photos. The trees & plants surrounding the chair made it difficult to really see the rods, so I decided to just play with Photoshop & see if a white background would help. Now, I was NOT doing this the Photoshop easy way, but I always forget how to do that, and the ever-wonderful Michael wasn't here to help, so like I said, I just started to play. And I gotta tell ya, I really like this glowy effect much better than the "correct" glowy effect (after Michael got here, he showed me how to do that). In fact, I'm going to use it with some photographs of my own personal chairs - I've been trying to figure out a way to make them seem magical, with no luck, but I think this is the method. So my apologies to all you Photoshop people out there, who are just rolling your eyes, but I really like this effect. And PS - doesn't this chair remind you of Salvador Dali's mustache? PS#2 - For some reason, this chair looks very lavender-y when I post it to this blog. I've noticed in the past that I have to color-correct photos differently for posting here because the colors just don't match the real deal, but I forgot to do that with this. I'll try to fix it. In the meantime, if any of y'all out there know any blog tricks to take care of this little problem, I'd love to hear from you! Muchas gracias! It does look like Dali's mustache. I didn't realize that until you mentioned it. Very fanciful. And your glowy rendition is as well. Such a visual discovery--I'm so glad you risked taking the pictures. Glad you didn't break any bones. San - Me too! Thanks for checking back & taking a look. It's much appreciated. I like the effect! Art is in the eye of the beholder...as for the falling....I think we all need to learn to laugh at ourselves when that happens no matter how humiliating. We take ourselves WAY too seriously most of the time! How cool is this??! What a girl! (ahem, I mean woman) to confront your fears like that! I bet you gave them a cool story (for their blog..a tatoo blog of course) "Hey, this Artist came up today...yes, an ARTIST, honest to God, and she wanted to , like, take a picture of our chair!? GO figure, how cool is that? An Artist came over..."
Bravo for bravery! Great photo. I couldn't help but laugh when i read the part about you falling when you were approaching them...that is something that I would totally do! haha! As it turns out, it's a VERY small world. I got home last night & turned on the tv in the midst of the rebroadcast of yesterday's city council meeting. And who was on the tv? Yes, the people who own this very house & this very pink chair! They wanted to have the house re-zoned for a hair salon. (They were granted their request.) When I mentioned this to the lovely Katie, she asked me the address of the house, and it turns out she knows these people - in fact, their OLD hair salon used to be located right next door to her Pilates studio, and I MYSELF have seen these people going in & out a million times! They just moved in the last few days. TOO WEIRD! More serendipity.